Dreaming of a return to Pine Mountain was escape and perhaps death, but building chairs was adjustment and regeneration. With five tools—an axe, a drawknife, a shaving horse, an auger, and a chisel—you can turn trees into chairs. Post-and-rung or "stick"" chairs are simple and satisfying to make. During bad economic times their simplicity of construction makes them an easy item for country folk to produce and sell. During better times the satisfaction of making your own chair is reward enough. What sort of chair are you going to make? Certainly you want one that fits and pleases you. I will give instructions here for a small, low rocker, but it's best to find a chair that you like, set it beside you, and copy it as you work. Nothing is quite so good as having a pattern close at hand. After a copy job or two you'll be ready to try one freestyle with confidence. When you sit down, you don't want to have any doubts about what you're sitting on. To a great extent, the tightness of the woven seat pulled even tighter by your sitting on it is what keeps the chair together. When you lean back, though, the chair is prevented from coming apart, or "racking," only by the security of the bond between each post and rung. As it was in making rakes, part of the secret of strength is to use differential shrinkage to bond the joints together. Everywhere that one of the rungs (horizontal) goes into a post (vertical) the former should be bone dry and the latter still somewhat green so that the joint will age itself tight. if you do, your chair will squeak when you rock. for weak wood by spreading the load in larger joints. The weaker the wood, the larger the size of the mortice and tenon joints that you must use. 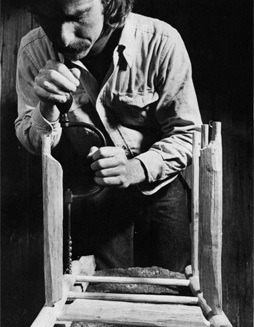 One last thing to remember is never to whistle when you go to cut wood for a rocking chair, for if you do, your chair will squeak when you rock.